ETC Supplies stocks a large range of embroidery machine frames. Both for Industrial embroidery machines and Domestic embroidery machines. 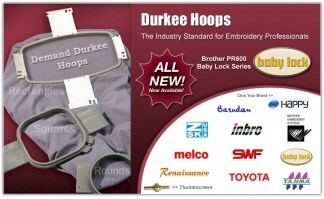 You can choose from the high quality Durkee embroidery frames or the Economy brand frames. 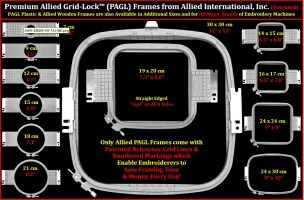 Simply select your machine brand, the field size (distance between ends of frame holder arms) and your choice of frame. Economy frames do not have the same warranty as the Durkee frames. Please note. When the description is for Brother this is NOT for Brother PR machines. This is for Brother industrial multi head machines. Brother PR machines frames have the term PR in the description.